Along with the likes of Kyuss, Monster Magnet and Fu Manchu, Nebula helped shape the direction of the ’90s desert/stoner rock movement. They didn’t necessarily enjoy the high profile fanfare and commercial success of their peers, but thanks to impressively consistent recordings and Eddie Glass’ signature guitar style, Nebula quickly established themselves as one of the genre’s leaders. In a move hopefully inspired by fierce independence, and not a waning of interest in the band’s sound, Nebula is unleashing their latest effort, Heavy Psych, on their own record label, a curious decision considering that previous efforts have appeared on the reputable Sub Pop and Tee Pee labels. Truthfully, Heavy Psych is not a huge leap from 2006’s Apollo and that’s okay. After all, familiarity is the element that has kept Nebula going strong for so long. Stagnation is not an issue, for, as most longtime listeners will point out, the band has always made efforts to add to their repertoire with each release. The new material doesn’t offer the same kind of raw blistering freak-outs found on Let it Burn or To the Center but instead opts for a more polished approach, a decision that places more emphasis on texture and song development, especially during the band’s more laid back and spacey moments. Heavy Psych represents the next step in Nebula’s maturation, one in which the members perform more as a collaborative unit and less as sit-ins on an Eddie Glass showcase, something the older works tended to be. Trust me, on tracks like "Aphrodite" Glass continues to create mesmerizing swirls of guitar-driven sonic euphoria; it’s just a bit more tempered and thoughtful now. If anything, a more distinct classic rock element can now be detected. "The Dagger" has moments where the band plays with some Hendrix-like rhythms and "Pulse" seems to lean toward the style of some of Rush’s early work, or even Fish Rising-era Steve Hillage. The album as a whole has no glaring weaknesses, but there are a couple of minutes of curious computer-voice dialog at the end of "The Other Side" that seems to be misplaced and a bit amateurish. Strange. 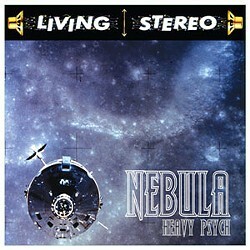 If anything else needs to be said, it’s this: Nebula’s legacy will not hinge on Heavy Psych, or any other individual release, for that matter, for the band’s reputation has been long cemented by their spellbinding live performances, an arena in which these six songs will receive proper treatment. And here, folks, is where fate has intervened. As it happens, Nebula is playing this Sunday (Sept. 7) at Aunty Mo’s in Eureka. It’s also the only way, for now, that you can pick up this new release. Nebula performs Sunday with Totimoshi and Machete as part of this weekend’s The Future is Unwritten psych-rock festival. Doors open at 9 p.m.